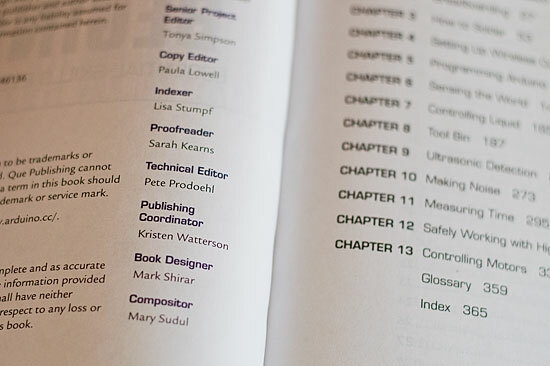 It seems like just a week ago I mentioned a book, and it was, but here’s my confession: being a contributing photographer to a book is pretty simple. At least it has been in my experience. 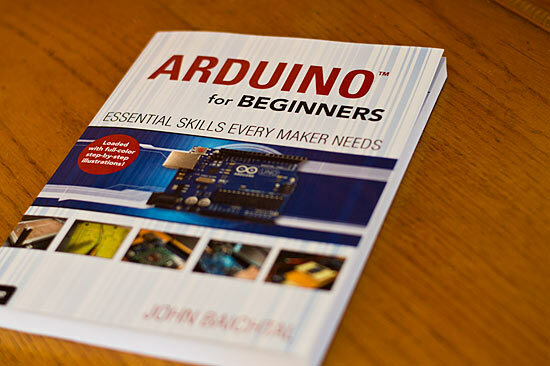 Writing a book is a huge beast, and while I did not take on such a herculean task, John Baichtal did, and somehow he convinced me to serve as the Technical Editor, and the result is Arduino for Beginners: Essential Skills Every Maker Needs. My name is in print. I know, we’re in the future now, and dead trees are dead and what not, but I still like the fact that there’s ink on paper in a book and it’s got my name in it. Did I mention the entire process took about a year? If you think this book would be useful for you or someone you know who is getting into using Arduinos, grab a copy from Amazon. Posted on Monday, January 27th, 2014 at 9:27 am. Subscribe to the comments feed. Both comments and pings are currently closed. Post on your own blog. I just bought this book two weeks ago! Little did I know that you were a part of this. Awesome!!!! What a cool thing to be able to be a part of.